The Nature Conservancy will dedicate 107 forested acres on Nov. 28 that will become part of the conservancy’s West Hill Preserve. The preserve, which now totals 550 acres, is along Seman Road in the town of Naples, Ontario County, near the southern tip of Canandaigua Lake. Part of the Finger Lakes Trail passes through the property. Folks from TD Bank, a U.S. banking enterprise owned by a financial corporation based in Toronto, will attend the dedication of the Hickory Ridge parcel. TD Bank has provided funds to pay for this acquisition and other Nature Conservancy work in the Finger Lakes, as a green-minded offset to the bank’s use of tree-consuming paper. Little Falls celebrated the officially completion of the one-mile segment of the Erie Canal trail on Tuesday. Little Falls City Mayor Robert Peters along with state Canal Corporation Director Brian Stratton and several state and local officials cut a ribbon to celebrate the completion of a one-mile of the trail off of state Route 167 in Little Falls. The section helps connect 40 continuous miles of the trail from the city to Amsterdam in Montgomery County. This completed section marks more than 75 percent completion of the trail, with about 60 miles of trail left to finish. It is part of 10 miles of trail the Canal Corp. has been working on to help close the gaps in the 348-mile Erie Canal trail. Stratton said the Canal Corp. is making the completion a priority, and the 10 miles currently being worked on is expected to be completed by 2015. To fully enjoy the sights and smells that autumn in New York has to offer, try walking or biking along a multi-use trail. Take your time as you stroll or pedal your way through a canopy of bright fall foliage, breathing in the fresh air, and drawing in the scenery around you. Multi-use trails such as rail and canal trails, greenways and bikeways are family friendly places to walk, run, or bike. Many are along historic railways or canal corridors and are mostly flat. Many of the trails are also located near scenic rivers and streams. One thing they have in common, however, is that they all offer a view of the beautiful foliage during the fall months. Parks & Trails New York has put together a list of Ten Terrific Trails we recommend for fall. To find a trail near you, use TrailFinder, Parks & Trails New York’s online guide to multi-use trails across New York State at www.ptny.org/trailfinder. TrailFinder can be used to search for trails in several ways—by trail name, by trail attributes such as length, surface, allowable uses, distance from a particular location, or by browsing the interactive map. Parks & Trails New York is New York’s leading statewide advocate for parks and trails, dedicated since 1985 to improving our health, economy, and quality of life through the use and enjoyment of green space. Find out more about Parks & Trails New York by visiting www.ptny.org and our Facebook and Twitter sites. Erie Canalway Trail – Between Albany and Buffalo more than 270 miles of Erie Canalway Trail provide the opportunity to experience quaint towns and a bounty of fall color along the state’s historic New York State Canal System. The longest continuous stretch of trail begins in Lockport, about 10 miles east of Buffalo, and continues 100 miles to Lyons along the Erie Canal in western New York. Other long stretches can be found in the 36-mile Old Erie Canal State Park between Dewitt and Rome in central New York and the more than 40 miles of trail between Little Falls and Amsterdam in eastern New York. When completed, the Erie Canalway Trail will provide 365 miles of multi-use trails along the canal, making it the longest intra-state trail in the country. Catharine Valley Trail – The hillsides resplendent with autumn color above Seneca Lake are a perfect backdrop to begin a visit to the Catharine Valley Trail in Watkins Glen. The 10-mile trail follows abandoned railroad and canal towpath corridors through the 900-acre Queen Catharine Marsh, historic villages, and a heavily wooded, glacially carved valley Located in the heart of the Finger Lakes. Pat McGee Trail – In the western Southern Tier, the relatively rural 12-mile Pat McGee Trail offers the opportunity to experience the colors of fall while passing through woods, wetlands, and open fields filled with rich a variety of plants, trees, and wildlife. Cato-Fairhaven Trail – Ponds, wetlands, and old farm buildings add to the rural and agricultural charm of the 14-mile Cato-Fairhaven Trail. Dense stands of sumac, beech, maple, and aspen trees provide plenty of fall color along this corridor near the shores of Lake Ontario in Central New York. TOBIE Trail – What better place to experience autumn color than in the Adirondacks. There are plenty of opportunities to be surrounded by the best of fall foliage from this 12-mile trail that connects the five mountain communities that give the trail its name – Thendara, Old Forge, Big Moose, Inlet, and Eagle Bay. Catskill Scenic Trail – The Catskill Scenic Trail follows the route of the former Ulster and Delaware railroad. Young and old will find this an easy and enjoyable route through the foothills of the Catskills. The trail parallels the West Branch of the Delaware River for the entire route and offers many delightful fishing spots. Walkway Over the Hudson State Historic Park: Drink in breathtaking views of the Hudson Valley fully decked out in autumn color from more than 200 feet above the middle of the river on the longest, elevated pedestrian bridge in the world. The Walkway is the center piece of a 3.6-mile loop that links riverside parks, cultural attractions and historic points of interest on both the Poughkeepsie and Highland waterfronts. North County Trailway – Following the bed of the former Putnam Division of the New York Central Railroad, this paved trail winds more than 22 miles through the woodlands, parks, and suburbs of Westchester County. Historic rail stations and a beautiful bridge across the New Croton Reservoir add to the appeal of the route. Bethpage Bikeway – The 6.5–mile Bethpage Bikeway links Long Island’s Bethpage State Park with the South Shore at Massapequa. From the Park, the trail passes through a mature forest cover along the Bethpage State Parkway before entering the mixed evergreens and deciduous forests of the Massapequa County Park and Preserve. The park’s ponds, wetlands, and Massapequa Lake and Creek can all be experienced from the trail. It’s hard to imagine a place that has as much to offer the outdoor enthusiast in the Finger Lakes as its National Forest. Wild plums, abundant wildlife and a variety of terrain — plus plenty of place of throw down a tent and spend the night — greet those who enter the Finger Lakes National Forest. There are ponds in which to cool off, miles and miles of trail on which to walk and ride, and even a dedicated campsite for horses and their riders. http://www.footprintpress.com includes FL Nat’l Forest & more. The 16,000-plus acre plot of land between Seneca and Cayuga lakes, the majority of which was consolidated in the period between 1938-1941 when more than 100 farms were acquired under the management of the Soil Conservation Services, became a permanent part of the National Forest system in 1983. The Haudenosaunee originally inhabited the lands that make up the National Forest, but white settlers moved in to farm the land following the Revolutionary War. But farming became difficult by the turn of the century due to soil depletion and competition from other parts of the country, leading to the federal government’s involvement in acquiring the farmland from individual property owners. Administration of the Hector Land Use Area was turned over to the U.S. Forest Service in the late-1950s, leading to its eventual permanency as part of the U.S. Forest system. This writer — and family — recently hiked about 3.5 miles of the trails near the Foster Pond area of the Finger Lakes National Forest. Portions of the pathway were wet from recent rainfall — combined with the tamping down of the earth where horses had traveled through previously. One of the most remarkable things to see was the variety of terrain you pass through in a relatively short span of walking. You can be in a pasture one minute only to find yourself in a seemingly dense wooded area just a few minutes later. It was an enjoyable walk in the woods, leisurely enough to stop and pick some blackberries growing alongside the trail during the first part of the walk. We also were able to pick a plethora of wild plums and apples; there are rumors, too, of an ample blueberry patch, but we did not come upon that during this trip. The start of our hike found us in a lightly wooded area, passing by several ponds, then traveled along pastureland that provided a look at some cows grazing and seeking shade under trees. A steady incline brought us through a gate to the pasture — make sure to close the gates behind you lest some of the bovines get out — and into the deepest portion of woods we encountered. The area potential for the most mud were helpfully covered by bridges installed by volunteers working to make the main trail through the FLNF as easily accessible as possible. Our hike took place just before the official start of fall, but the leaves had already started to show signs of turning colors. A trip back in the next few weeks is a certainty — just as much of a certainty as the beauty of the fall foliage surely will be. The bulk of activity in the Finger Lakes National Forest revolves around hiking, whether it is the day variety or those setting up camp as they undertake longer journeys. The trails in the FLNF are pretty well marked — including signs showing the crossings of trails and the amount of mileage to get to other important intersections and points. The 12-mile-long Interloken Trail runs from the southern end of the Finger Lakes National Forest to the north, passing through various terrain and vegetation. The southern portions are somewhat steeper and more forested; the northern portions are flatter, more open and travel through pasturelands. It also travels by the Foster and Teeter ponds. This trail can be wet in the spring and fall, which this writer found to be the case during recent hikes there — particularly in the areas where horses travel creating depressions in the earth that fill up quickly during rainfall. There are outstanding vistas to the west, including views of Seneca Lake. The Backbone Trail, 5.5 miles one way, begins at the Backbone Horse Campground. The trail traverses the Forest through shrub-lands, pastures, old roads, and many old homestead sites. It intersects the Interloken and Burnt Hill trails to the south and the No-Tan-Tatko trail to the north. It is a relatively flat, primitive trail with natural tread, gravel in wet places, and traverses through fenced pastures. The Burnt Hill Trail, 2.5 miles one way, is located on the southern end of the Forest. It includes forests, shrub-lands and pastures, and offers many beautiful vistas along the way. It is a primitive trail with a natural tread. It has gravel in wet areas and traverses through the fenced pastures. The trail intersects the Interloken Trail. The Gorge Trail, 1.25 miles one way, traverses through Hemlock and hardwood forests, following the gorge between Burnt Hill Road and Mark Smith Road. It is located on the southern portion of the Forest. This trail intersects the Interloken Trail. Gorge Pond is located just east of the Gorge Trail trailhead on Burnt Hill Road. The No-Tan-Tatko Trail, 4.5 miles one way, is nearly all open pastureland and traverses the Forest in a north/south direction between the Backbone Horse Campground and Parmenter Road. From the Backbone Horse Campground, the trail goes north into Seneca County and crosses the Interloken Trail at Seneca Road. The trail follows Townsend Road east for about 0.5 miles then runs north to the parking area on Parmenter Road. In some of the pastures, there are outstanding vistas, including views of Seneca Lake to the west and Cayuga Lake to the east. The trail is relatively flat, with a primitive trail tread, gravel in wet portions, and mowed grass through fenced pastures. The Potomac Trail, 2.25 miles one way, travels through a variety of forest types and follows the edges of some of the numerous ponds in the area. This relatively flat trail has a primitive natural tread and traverses occasional wet areas. It is a nice loop on which to learn cross-country skiing and is also a popular game bird hunting area. The Potomac Trail network connects with the Interloken Trail and the Potomac Group Campground reservation area. The Ravine Trail, 3/4 of a mile one way, passes through Hemlock and hardwood forests. As the trail loops around, it crosses a stream in three places with native rock step crossings. It is a primitive trail with a native tread and is steep in some places. The Ravine Trail connects with the Interloken Trail at Burnt Hill Road. The South Slope Trail, 3/4 of a mile one way, is located at the south end of the Forest. The trail passes through hardwood and conifer stands and crosses a small stream. It is a primitive trail with plank boardwalk over wet areas. This trail intersects the Interloken Trail, and shares a portion of the Finger Lakes and North Country Trail Systems. In addition, the Finger Lakes Trail also passes through the forest. Trails that allow horseback riding — Backbone, Burnt Hill, Interloken and No-Tan-Takto — are closed to horses from March 15 through May 1 due to muddy conditions. Cross country skiing is available on the Backbone, Finger Lakes, Interloken, No-Tan-Takto, Potomac and South Slope trails. Snowmobiling is allowed on sections of the Backbone, Burnt Hill and No-Tan-Takto trails. Camping at the Blueberry Patch and Potomac Group campgrounds costs $10 per night, while camping at the Backbone Horse Campground is free of charge. People also are allowed to set up a site throughout the Finger Lakes National Forest without a charge, though no camping is allowed within livestock pastures between May 15 and October 31. For more information about the Finger Lakes National Forest, visit www.fs.usda.gov/fingerlakes or pick up a guidebook from Footprint Press. These 8 updated PDF maps have a revision date of 08/13. Trail Conditions notices have been posted for each of these updates. M15 – updated minor reroute within Watkins Glen, showing the formerly blue blazed route passing LaFayette Park and the FLT Monument as the now white blazed main trail. M14 – update needed to show the M15 reroute. QCML – update needed to show the M15 reroute. O1 – Hunting Closure date changes by landowner. M28 – major re-route adding 4.7 miles of trail, moving trail onto recently created Alley Cat route. M20 – loss of landowner permission requiring additional road walk was incorporated into permanent map. M29 & M30 – update with additional information, front and back, but no change in the route of the trail. B2 – an additional parking waypoint was added to GPX file, but the PDF map was not revised because the parking waypoint was already on the PDF map. The interactive maps were updated. The GPS files for maps M15, M20, M28, M29, O1 and B2 were updated. Click here to purchase FLTC maps. Ellicottville and Cattaraugus County offer some outstanding hiking options that appeal to hikers of all ages and abilities. Whether you want to hike for an hour or pack up, leave civilization behind and jump on some major trails that go on for hundreds of miles, Ellicottville is an exceptional place to start your journey. The Finger Lakes Trail (FLT) is over 558 miles long, starting at the Pennsylvania-New York border in Allegany State Park and carrying on to the Long Path in the Catskill Forest Preserve. This impressive trail also has six branch trails and 29 loop and spur trails that extend from the main FLT. These trails offer another 400 miles of hiking bringing the total length of the Finger Lake Trail System to over 958 miles of hiking….pretty amazing and the trail goes right through Ellicottville! Visit the Finger Lake Trail Conference website here for an interactive map and more information about the FLT. Little Rock City is a natural outcrop of conglomerate rock on an unglaciated plateau that the whole family will marvel over. If you are looking for a more casual hike with some incredible scenery, Little Rock City is a natural outcrop of conglomerate rock on an unglaciated plateau that the whole family will marvel over. There is one trail that goes through the rock formations of Little Rock City and it can be accessed from the end of the turn around loop on Little Rock City Forest Road. This trial is only open to hikers…no bikes, horses or motorized vehicles. 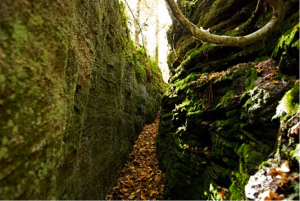 Whether you are looking for some relatively easy, interesting hikes that appeal to hikers of all ages and abilities or more advanced technical trails Ellicottville and the surrounding areas can provide the experience that is perfect for you. Other great local trails include: Pat McGee Trail – This multi-purpose trail will grow to be a county-wide system but at this time it connects the Village of Cattaraugus to the City of Salamanca. You can hike, bike, snowmobile or ride horse on the Pat McGee Trail. Allegheny River Valley Trail – Hundreds of people use this trail that surrounds the City of Olean and the Village of Allegany every day! The Conservation Trail/Finger Lakes Trail – White Blazes – This hiking trail begins in Allegany State Park and runs to Fancy Tract, near Machias. This trail has strenuous climbs and elevations range from 1,300 to 2,300 feet. Conservation Trail – Orange Blazes – This hiking trail runs north from the Conservation/Finger Lakes Trail junction to Cattaraugus Creek. This trail is moderately difficult with elevation ranging from 1,230 to 1,920 feet. Finger Lakes Trail System – this system consists of the Finger Lakes Trail beginning at the Pennsylvania border and runs 500 miles east to the Long Path in the Catskills. This trail is marked with white blazes on trees and posts, and identifier discs. This system also has 200 miles of branch trails. These are marked in the same manner except the color is orange. Side trails are marked in blue. Double blazes are used to mark turns or conditions of the trail.